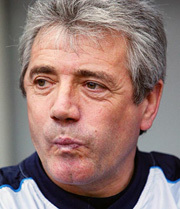 Geordie messiah to return – Kevin Keegan is returning to Newcastle United as manager. Then again, it’s entirely possible that there’s nothing giddy about this statement at all. It would be perfectly consistent with the administrative temperament of the club, after all, if the actual messiah had been available for the job, and Newcastle only approached him after being rebuffed by Gerard Houllier. What I love about Kevin Keegan taking the job is that it will lead to an explosion in coverage the main characteristic of which is that you can’t tell whether you’re meant to take it seriously or not. Ever since Sam Allardyce was fired last week, I’ve been seeing statements to the effect that “Keegan would be an interesting choice for the job” or “If they’re sensible they’ll look at Kevin Keegan.” Are these people being serious? Are they being sarcastic? I genuinely don’t know. There’s something about Kevin Keegan that makes it impossible to say. On the one hand, he did sort of save the club the last time he managed it. On the other hand, he’s Kevin Keegan. He seems to exist in a small dead spot on the resonating surface of tone. MORE ON KEVIN KEEGAN: His signature moment, the rant against Alex Ferguson concluding with the famous declaration, “I will love it if we beat them…love it!” In other news, Newcastle’s last match was a 6-0 defeat to Manchester United. MORE ON NEWCASTLE: Michael Hann goes in for a crunching tackle on Alan Shearer in the Guardian Sport blog today. Among the adjectives Hann uses to describe Shearer are nasty, niggly, cowardly, cruel, unhealthy (twice), and arrogant. Worth a read. Thanks to Martha for the link. UPDATE! MORE ON THE SUBLIMITY OF LATE 1970s POP MUSIC: Tom at Pitch Invasion (who’s been agitating for Keegan all along) points out that bloggers are about to unleash a torrent of awful Keegan photos to commemorate today’s news. So here’s mine: the cover of his best-known single(*), “Head Over Heels in Love,” which peaked at #31 in the UK pop charts in 1979. 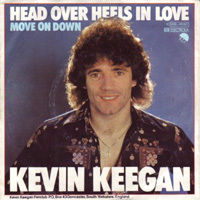 The B-side is “Move on Down,” which makes the single overall a plausible soundtrack for the likely before-and-after narrative of Keegan’s decision to take control of the club. I like the way Keegan’s perm blots out the bottom of the song title. How do we know the record isn’t actually called “Head Over Hffls in Love”? I don’t think we know that. * The original version of this post stated that “Head Over Heels in Love” was Keegan’s debut single. In fact, as any Tyneside schoolboy could tell you, Keegan released one earlier single, “It Ain’t Easy,” six years before. Why do all his song titles seem to bear directly on the experience of coaching Newcastle United? It’s all I can do to keep from cheering about Keegan’s return (and not just because of all the great videos we have to go with the awful photos), while simultaneously berating myself for being so easy. If I’m honest, I’m guessing King Kev wakes in the cold sweat in about five hours, wondering what on earth he’s done. Couldn’t you have embedded an mp3 of the song along with the photo? More, Kev, More! I think the mystery about what will happen is something you’ve captured nicely here. He is one of the few charismatic managers about whom you do think — anything could happen today, this season, tomorrow. He could walk away tonight and I wouldn’t be surprised. He could lead Newcastle to a Champions League spot driven by pure adrenaline and I wouldn’t be shocked. He could turn up in a shellsuit and a hairdo matching that record at St. James Park and I wouldn’t raise an eyebrow. Anything’s possible with Kev: magic. Originally, I thought it was more charitable not to. But now? Just remember that you asked for it. I think we should put together a group post titled “things we wouldn’t be surprised to learn Kevin Keegan did.” In fact, you’ve given me a great idea, Tom. This might have to be the next Run of Play contest.